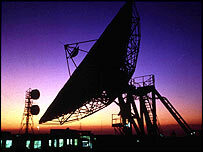 Goonhilly Earth Station in the south-west of the UK is one of the largest communications stations in the world and keeps us talking to each other in real-time. Every e-mail, every TV picture, every phone conversation, is blasted into millions of tiny pieces of data and beamed through the air. And if you are sending your data a few thousand km, the chances are you would be using a huge dish to do it, such as the ones at Goonhilly Downs, a flat, rocky space in a remote part of the Cornish peninsula. In 1901, the first ever transatlantic radio message was sent from a site near Goonhilly Downs to Newfoundland, and received by none other than Guglielmo Marconi, the great pioneer of wireless. Marconi's demonstration was a breakthrough in technology. And thanks to speedy developments, it was not long before the distances being covered were far greater than the 3,000km between Cornwall and Canada. Soon, we were sending messages to and from space. 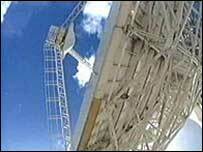 Today, there are over 60 dishes in total in Goonhilly, some as large as 32m in diameter, and 450 tonnes in weight. "Goonhilly is the site of probably one of the largest communications centres in the world," says Alan Bradley, the operations manager at the Earth station. "At the moment we're carrying data, voice and internet connections around the world, and we provide banking services for very large banking organisations. "Goonhilly's always been at the forefront of technology and as such has been involved in many ground-breaking communications events, such as the Olympic Games and the Muhammad Ali fights. 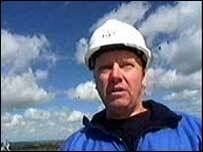 "Goonhilly played a major part in Live Aid." However, there is often confusion about what goes on at the Earth station. "The first two questions are always, 'Is it military?' and 'Are they spy satellites?'" explains engineer Shaun Dunbar. "No, we're nothing to do with that, we're communications. "Other people think we're looking into space, looking for aliens. We're actually part of BT's UK network, but we're that bit that plugs in to the rest of the world. "If you put a one bar electric heater on the Moon and stood on the Earth and put your hand up to it, that's the strength of signal we receive." Accuracy and alignment are also vital, according to engineer Shaun Dunbar. "We have to track at a thousandth of a degree accuracy. You imagine 22,000 miles out in space, a small movement down here is multiplied hugely out there. A one degree error down here misses the satellite by [a huge distance]." There are also many common misconceptions about the satellite dishes. As Tony Hutchinson, engineer at Goonhilly explains: "While you're standing underneath a dish, it looks like everything's completely still, but the antenna actually has to move all the time to keep tracking the satellite, because of how far away the satellite is. "The motors and gear boxes are continually moving a tiny little bit just to move the antenna and keep it perfectly aligned with the satellite at all times." The next time you make an international phone call remember that you are being squeezed down a phone wire and shot up into the sky and then back down again, all in the blink of an eye. Click Online is broadcast on BBC News 24: Saturday at 0745, 2030, Sunday at 0430, 0645 and 1630, and on Monday at 0030. It is also shown on BBC Two: Saturday at 0745 and BBC One: Sunday at 0645. Also BBC World.